As most of you know and who had been following my blog, I was presented with the coveted Silver Beaver Award last year in March. 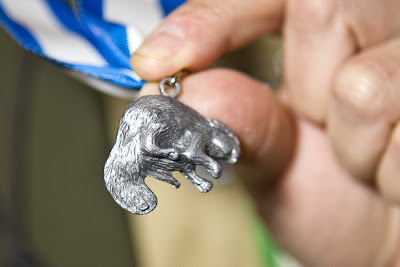 Since I was the award recipient, I was invited to the 2008 Silver Beaver Review Board in December. We sat down and pounded out on reading and review Silver Beaver Applications, and resumes. Tonight was the Silver Beaver Reception at the Smiser Scout Center in Pasadena. I remember my reception vividly of last year as if it was yesterday. I remember walking in on time, but to my surprise everyone was in the room and had their portrait photographed already. I felt bad because I was holding up the photographer from packing up his equipment. Anyway, this year, everyone was very happy and excited about having their portraits taken. They all borrowed a Silver Beaver Award and had it temporarily around their neck for the picture. Everyone was posed perfectly albeit they all look so uncomfortably like a robot. "Chin up, look here, tilt head, move arm and lift elbow, etc.". Belle n' Beau are famous for their classic portrait, and I guess that's what it takes to look perfect and be capture in time with a still photograph. It was an important moment and event. I guess it was all worth it in the end.